While the ultimate goal of every season is to hoist Lord Stanley's cup, the mission set before the Penguins in this first round was to defeat a rough, talented, and underrated Ottawa Senators team. This task turned out to be more difficult then anyone would have hoped as the Senators were able to make a six game series feel much longer. But in the end, despite a couple of rough games, the Penguins were able to execute their game plan, get the victory, and start marching towards their second round opponent. If there was any doubt that Sidney Crosby is the best player in the NHL right now, this series should have erased those doubt. First of all, he leading or tied on the team in every major offensive stat except PPG (Geno has 3) and tops in the NHL right now in points (14) and assists (9). Also, Mr. Crosby had at least two points in each of the first five games of this series. In fact, Sid had more points in this six game series then he had against the Senators in the past few season combined. That would be impressive on its own, but what puts him over the top right now was the play in the Pens defensive zone which included a goal saving play in game 2 as he dove behind Marc-Andre Fleury to knock the puck out of the goal mouth. And to top it off, on several occasions, his back-checking directly lead to counter attacks and goals. That is leadership. That is excellence. That is how you win Cups. But obviously Sid did not win this series on his own. Just about every single player on this team stepped up when needed. All series long, Matt Cooke played his game. He punished the Senators as expected, but also consistently chased down loose pucks and made Ottawa fight for possession, especially in their own zone. But in game six, the Pens needed goals if they were going to come from behind and win. So Cookie put his brass knuckles away, tightened his grip on his stick and channeled his inner SUP87MAN, scoring twice. Marc-Andre Fleury rebounded from a rough game 1 loss and regained the playoff form we have become accustomed to by winning two one-goal games and three road games by making some of his trademark "How the hell did he stop that?" saves. Essentially, when the guys in front of him faltered, Flower was there to hold the fort until they recovered. Pascal Dupuis looks like he's ready for the superstar treatment at A&L Motors after his first round performance. His plays aren't flashy and he usually doesn't end up at the top of any stat sheet, but every time there was a big play to be made, Dupes was there. And in the end, when the Pens were battling to avoid having to play in a game seven, when they could sense the victory in front of them, when they needed a goal, Dupes was there. And we cannot forget the contributions made by Craig Adams. He is like a ninja on the ice. Just when you forget about him...BAM! There he is in the defensive zone shutting down scoring chances. Then he retreats to the shadows again until....BAM! There he is netting an awesome backhand goal to give the Pens a chance to comeback in game 1. And now he waits in the shadows for his next victim. But this series was not without its problems, too. 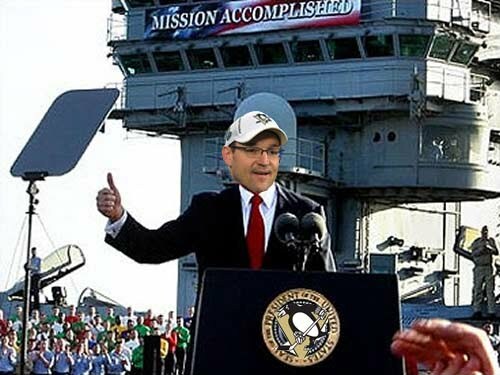 The Pens and Dan Bylsma have a few things to work on before round two starts. No team is going to play perfect, but there were two key areas where the Penguins struggled the most. All season long, the Pens have lived off off of their penalty kill, but in this series against the Senators, the PK was simply terrible. It sputtered at 68.2% which is 15th out of 16 playoff teams. It was only one series and this is in no way a reflection on what the Pens are capable of, but they need to reel in the PK, figure out how Ottawa was getting the best of them, and make sure it doesn't happen any more. The other big problem that seemed to plague the Penguins all series long was turnovers. And this was a problem from top to bottom. And the worst part of it is the Pens were committing a lot of these turnovers in their own zone. Poor cross-ice passes, failure to chase a puck down in a corner, and ill advised stretch passes were occurring way too often and lead to numerous chances for Ottawa and directly lead to both losses in the series. So now the Penguins are on to the second round. Currently they have two potential opponents. If Montreal can pull out the biggest upset in playoffs history (okay, maybe not, but it would be huge), then the Pens would play the Canadiens in the next round. Knee-jerk reaction is that this would be great, but remember, they just beat the Capitals who are the current Presidents Trophy winners. If the Caps win, though, the Pens go on to host the Boston Bruins in round two. Again this feels like a great match-up, but the have one of the hottest goalies in the league right now, they are probably still pissed off at Matt Cooke, and Miro Satan is playing like a beast. As always, Pen Universe in behind you, boys. Let's get it done!